The second annual Texas Digital Humanities Conference, co-sponsored by the Office of the Provost, the College of Liberal Arts and the UT Arlington Libraries, will be held April 9-11 at the Central Library. The three-day event will focus on a better understanding of the history and future of digital humanities in Texas, specifically addressing issues related to secondary and higher education. The departments of Art & Art History, English, History and Linguistics & TESOL, as well as the Honors College, are also sponsors. Keynote speakers for the conference are Alan Liu (University of California-Santa Barbara), Adeline Koh (Richard Stockton College) and George Siemens (UT Arlington). Rod Sachs, a graduate teaching assistant in the Department of English, said the conference program is designed to help undergraduate and graduate students understand the nature of digital humanities and the applications available. Sachs, a presenter, is excited about the conference. Historically, digital humanities has been described as the digitizing of rare and out-of-print texts or digitizing maps (for use in cartography) or using digital sounds to study language (as many of the faculty and students do in Linguistics & TESOL). But Sachs argues the field should also include those who glean new information from these digitized items as well as those who present knowledge in more modern formats. 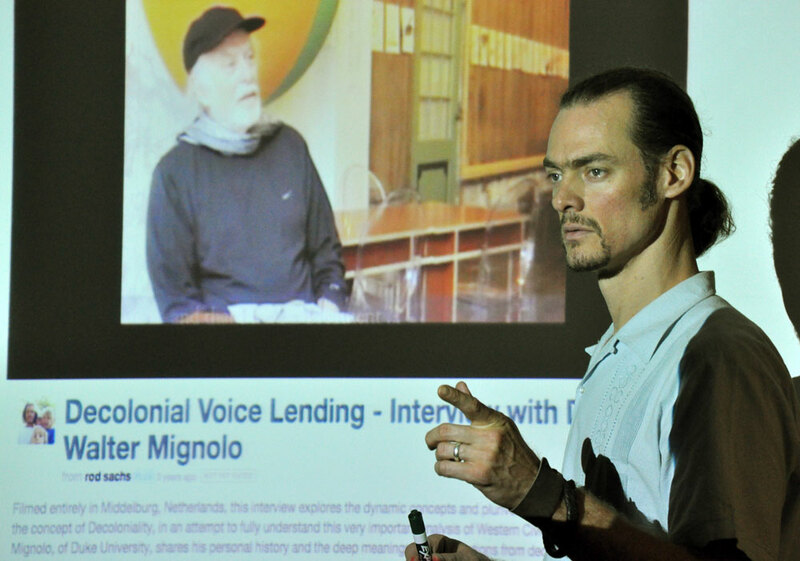 As an undergraduate student at UT San Antonio, Sachs began filming professors like Walter Mignolo (Duke University) at the decolonial scholar’s summer course in The Netherlands, then posting mini-documentaries online for a global audience. Stvan said the interdisciplinary nature of digital humanities and how the latest technologies are applied intrigues her the most. Stvan is also pleased UTA is hosting the conference this year. Faculty members and staff from several departments and groups worked on the planning team and are eager to show how invested UTA is in the field. “I think the conference highlights some of the longstanding strengths UTA has had,” she said. “UTA is focused on data-driven discovery to share new knowledge and enhance current knowledge. So it’s a perfect time to show how big data is being interpreted in the humanities. Registration for the Texas Digital Humanities Conference (TxDHC) ends March 27. For more information, visit the conference’s web page. TxDHC is an organization of Digital Humanities Initiatives, Centers, and Institutes in the State of Texas. The consortium was organized in 2013, with UT Arlington, University of Houston, Rice, Texas A&M University, University of Texas at Austin and the University of North Texas as founding members. Reblogged this on Clio's Intemperance.